LEDs did not work. Haven't bothered to ship back for a fix. Maybe they work, but also don't function on my MBP. So not really sure. 8. Plug Aorus Gaming Box 1070 in. It is hot pluggable. If it doesn't detect in Device Manager, try restarting laptop with device plugged in. 11. Apply AORUS_N1070IXEB_8GD_VER10H2D.bin using FwUpdateTool.exe - it's a self explanatory FW updater. Just make sure you select Gigabyte device. You must use the 16.2.55.275 thunderbolt driver because the newer version doesn't work. 14. You should be good to go. You can re-enable driver device updating from earlier steps if you want, but do not recommend because microsoft auto updates for drivers is terrible. 2. Expand "Universal Serial Bus controllers"
4. I disabled the 3.1 edition and i quit receiving USB errors. You may want to ensure you disable the correct one. Only do this if you're having USB issues please. Solid laptop with solid specs but the weight makes this a pain. Has full plug n play which makes this one of the most convenient ways of getting good gaming going... too bad on the weight. May look into selling it at one point unless I think I need it. Also I disable the touchscreen because it breaks Street Fighter 5. 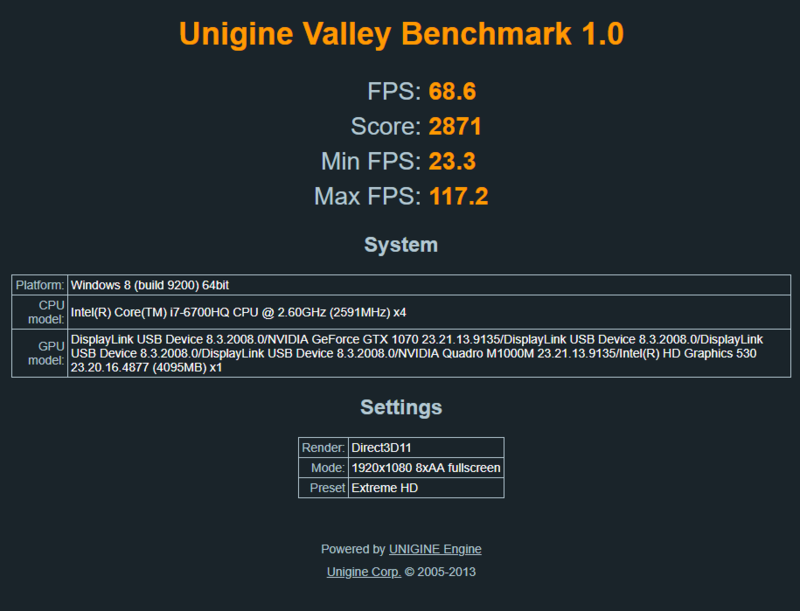 Here are a couple more benchmarks with higher resolution. If you want me to bench something I can do that sometime... I don't own a lot of games but if you have a specific tool or game in mind I can look into it. I'm actually a little worried about my benches because it looks like my 13" MBP with a dual core i7-5557U is benching a bit better than this machine, despite also being on TB3 and the MBP being TB2. I looked around online and it seems like I'm benching near what other people have though... so maybe the P50's base clock and turbo clock just can't keep up. Especially since the MBP is a god at maintaining turbo clock speeds through and through. Ultimately the MBP will lose every time on operations that require more logical processors since the P50 has a 4C/8T setup, but in gaming it looks like the difference is negligible. However, I do think the P50 wins out on temperature control due to the dual heatsink setup, as the M1000M will not be generating any heat since it's disabled and all graphics operations are running through the eGPU. Thanks a lot for this great post - it was the one convincing me to try the eGPU with my P50 evnethough it says "not supported" and I am really happy i did. I chose a Gigabyte Aorus GTX1080 instead of the GTX1070 do to stock availability and only a small price difference. My P50 is spec'd the same as yours except i got myself a 1TB NVMe SSD (Samsung MZSLW1T0) and NO touchscreen on my 1920x1080 screen. Otherwise the same setup. 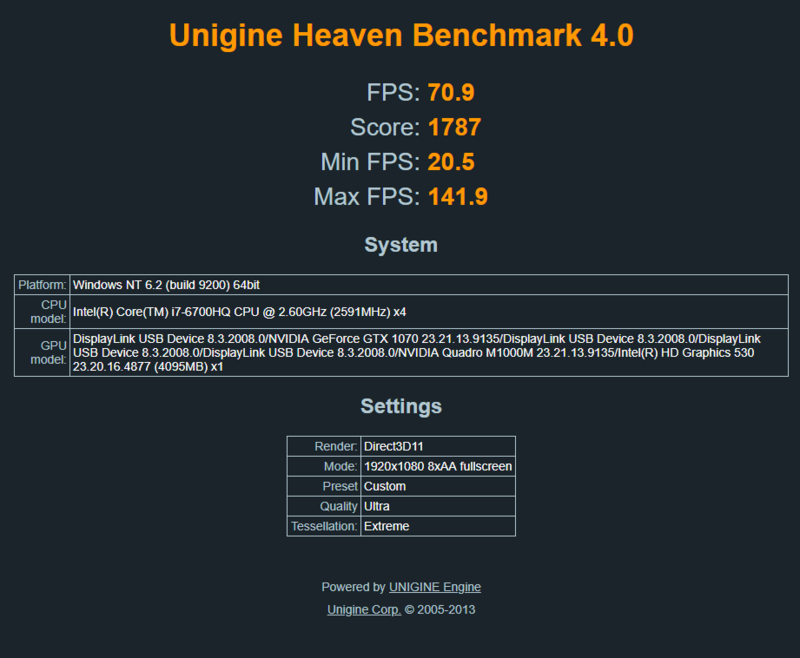 On Unique Heaven Benchmark 4.o at Extreme setup (the one you got 85.3FPS) my setup got 89.9FPS and a score of 2262. On the one you got 70.9FPS mine scored 78.5FPS and a score of 1976. So very similar results eventhough it is a GTX1080 vs. GTX1070. I'm wondering what the bottleneck is and how to find it. 3. Download and upgrade firmware (H2D fix) from Aorus webpage. 5. 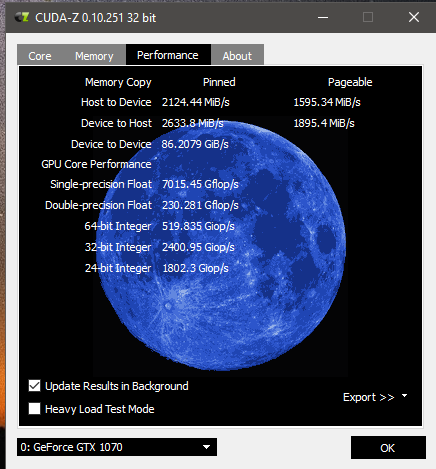 Opened Nvidia Control Panel and changed "Global setttings" to "Nvidia Processor with High Performance"
Then all has been working without any problems. I checked my Intel drivers for thunderbolt but they were already up to date, and I did not need to disable any USB 3.1 or 3.0. 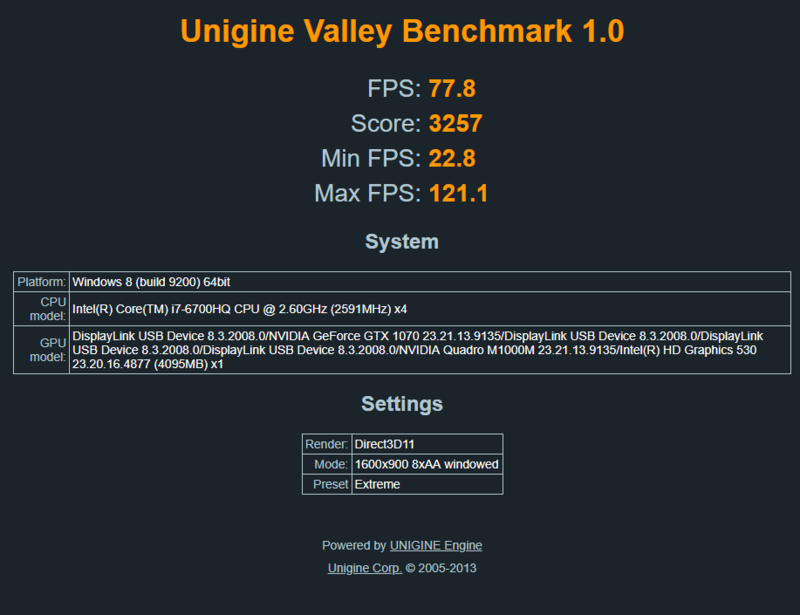 Tested with Camtasia, The Hunter, Diablo 3, Civ5, 3Dmark and unigine Heaven, all with good results. I am very pleased with this setup and I can recommend the upgrade and combination with the P50. Sorry for the late response- didn't get an e-mail notification that someone replied to this. Are you on the same P50 CPU I am? I think there is another i7 that is slightly worse, 6820HQ? I would double check your CUDA-Z bandwidth. Also are you using an internal monitor? That will definitely hurt you in those benches. Would also love to hear if your USB stuff is still working fine after 1mo of usage. From my browsing on egpu subreddit, this is a common problem. Maybe they fixed it with 1080 edition? My appoligies aswell. 🙂 Aparrently posting on a topic doesn't automatically make a subscribtion. 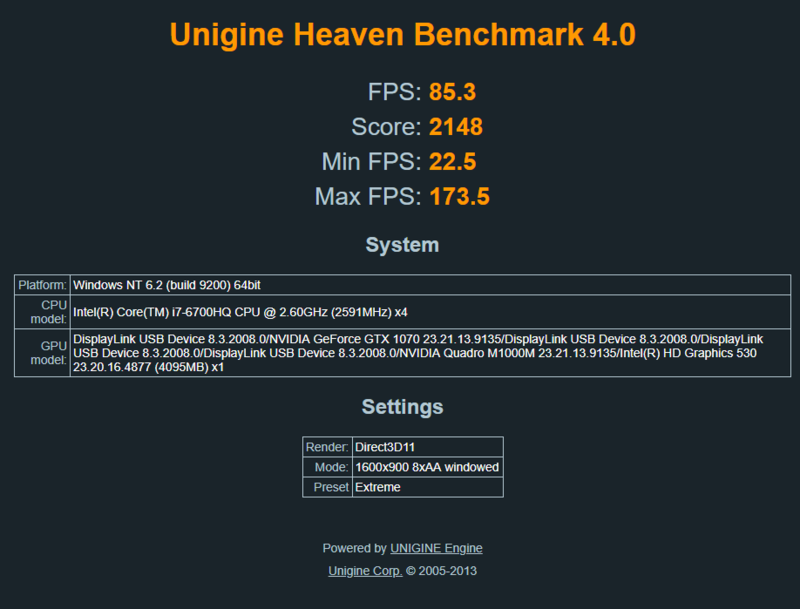 The CPU in my P50 is: Intel(R) Core(TM) i7-6700HQ CPU @ 2.60GHz, 2592 Mhz, 4 Kerne(r), 8 Logisk(e) processor(er). So you are right; my CPU is slightly less powerfull in comparison. wondering if the CPU is the bottleneck. Sourceforge is down so I can't check the cuda-z right now. The USB problem you experienced haven't occured on my setup. Wondering if it is an Intel update or a fix that have been solved in the GTX1080. I also don't have to disable my internal M1000 GPU. It can be enabled and run other programs simultaneously. 1. I need to restart my laptop in order to have the GTX1080 "connect". Returning it from sleep doesn't work. 2. The short thunderbolt cable. I have tried a few different Thunderbolt cables but the performance is somehow reduced significantly. I am on my normal laptop monitor. Haven't tried out with an external yet, but i'm definately going to try and see the performance difference. I see. I hear about the USB problems on reddit from time to time but that's it. I never got mine working though my aorus box came without working LEDs so maybe related. The only time I had to disable my M1000M was for SFV as it caused my screen to go green for some reason. I didn't think I'd need it anyway, so I always just disabled it unless I was on the road. Which verison of Windows are you running? Personally I never could get egpu working from out of sleep but if you're on W10 with the latest build it might be better now. I did some benchmarks yesterday with an external 4K TV. I experienced increased performance. First run was 2201 (87.4 FPS) and second run was 2209 (82.1 FPS) both with the M1000 enabled too. Comparing to the internal monitor test (which had a score of 1976) its a 12% performance increase. I did the test with the M1000 disabled giving same result. Heaven shows both cards Clock's when running, but I am not sure if the M1000 is active at all. I noticed that each "scene change" in heaven makes the FPS drop to about 20 and then it increases fast again. Is this normal behaviour? Also with an internal GPU setup? Regarding the TB3 cable,- you are absolutely right; It seems like a jungle to find a good one. I will go hunting for a good 1-2m cable. Haven't found one yet. Next one will be an active one. I have Win 10 Pro latest build - I did try to plug it in without restarting and had it working, but it does not seem so robust. Sometimes it works, othertimes a restart is required. Now i am able to hot-swap the Aorus GTX1080 with my Lenovo P50 running win10 (10.0.17134 Build 17134). So i can return the laptop from sleep mode having steam running on my internal M1000, plug-in the Aorus GTX1080 in the USB-C TB3 port and then launch a game in steam, and it will run on the GTX1080. 🙂 Why it suddenly works? Don't know.. There have been a BIOS update in the P50 recently, but I am unsure if this is related. All i can say is that hot-swap is now working on my setup. I will try to find a good 2m cable to. It seems like AkiTiO and Startech has 40Gps 2m cables. So I am going to test one of these. I will try to benchmark it on my laptop screen and on my new Dell 2715h 2560 x 1440. On the subject of the sleep function. Did you recently update Windows 10? I was using W10 Enterprise LTSB (build 1607) on my T480s (and on my P50 when I used it) and Sleep never worked. I just recently moved to W10 Enterprise build 1803 and sleep works great for me. In fact I feel like I have way less problems in general now. Everything is much more plugnplay from my VR headset to my eGPU. As for the FPS drops. I never noticed anything like that. Though I haven't benched in a while and I don't play much AAA games on either laptop. Also if you ever have issues where the TB3 connection is not detected, just unplug the power from your Aorus Gaming Box, and wait 10 seconds, then plug it back in. Leave the TB3 cable plugged in. That usually fixes it for me. When I was using my P50 my TB3 port on the laptop was VERY finnicky- don't have this problem on my T480s though. I did not update windows between the posts, so can't say why it wouldn't connect. Maybe, it was just the fact that the Gaming Box sometimes needs a restart before it connects. It is pretty easy to see, as the LED's dont't get lid up, and the fix is just to replug the box from power. Which specs did you choose on your T480s? I got the result for the 2m cable now and it seems to be working. I did a test on my internal monitor and got a score of 1969 which is very close the result using the stock 0.5m cable which had a score of 1976. Another thing, I noticed that the Yoga was able to charge through the USB-C TB3 port, which my P50 does not. I guess it is because it requires 130W which is above the rated 100W for the TB3 cable. So far it seems like the Coetech gives a result just as good/bad as the stock 0.5m. I am wondering if it is possible to get better results with one of the other cables. Next up, I'll test with the external monitor. It resulted in slightly worse performance on my internal screen in heaven extreme bench: 1880 for the 2.0m cable and 1902 for the 0.5m cable. There is a slight reduction (-1,2%) in performance with the longer cable compared to the shorter stock cable. I am not sure why the new driver has lower performance. Maybe because there is lower clocking in the Auros software, which I also reinstalled. You're right about the USBC Power Delivery. In fact Lenovo didn't even implement PD so you can't even get it to charge. Would've been nice if it at least could charge the <100W that USBC can do since you're not necessarily always going to use 130W. I'm also using the new drivers, but haven't noticed anything yet. I may rebench sometime this next week especially since I changed to current branch Windows 10 from Build 1607. From my understanding the newer W10 builds actually perform better. I would check the nvidia subreddit for driver benchmarks. There's usually some guy who benches them as they're released. Sometimes it depends on the game/benching tool but the performance can go up/down between drivers. It seems to me like the performance differences have variance from things like what's running, and not indicative of the driver itself. I could definitely be wrong though. Windows is always doing something in the background. I am considering a T580. Is it able to charge? Here are the results using the 2m choetech cable and an external monitor connected to the Aorus Gaming Box. The run showed 2119 (84.1 FPS) compareable to the 0.5m cable which gave 2201 (87.4 FPS). I had two more screens (laptop and a 1080p) showing desktop and some background programs like outlook running while benchmarking. So I am not sure if it is a fair comparison. Connecting the external monitor the laptop reduces the score to 2002. 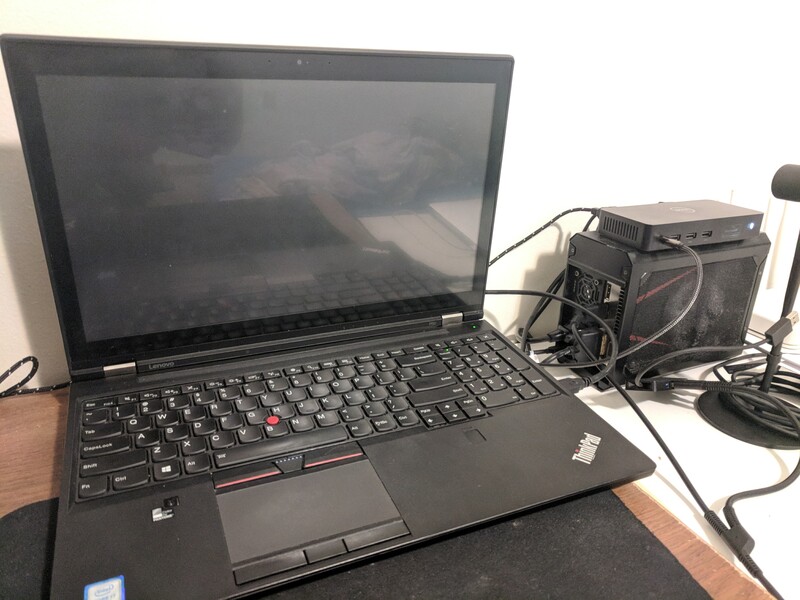 I think I'll try to sell the T480s. I liked the laptop (aside from the terrible trackpad compared to the glass trackpad on the X1C6), but I really need my VR setup to work well.